I felt strong last week doing the Cybex shoulder press so I wanted to see how it would translate this week in the seated barbell shoulder press. Although the numbers were much smaller they were good for me. I topped out with two slow and full ROM reps with 155 pounds on the bar. 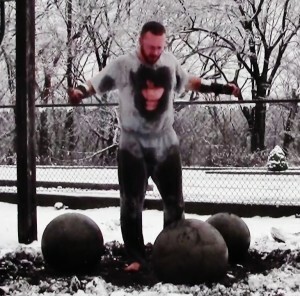 I also pulled the 100 pounders doing bent over dumbbell rows so it was a productive session. In the back of my mind I have been hoping I don’t hurt myself the last few days since I have scheduled to meet up with IronLoo at the world famous Stonepark on Sunday, our first full day in NYC. I expect it to be a brutal yet memorable workout which no doubt will leave me walking around like an 80 year old the remaining three days we have in the city. Oh, I weighed the hex bar at the gym. It was heavier than the standard 45lb olympic bar but not by as much as I expected. It checked in at 52 pounds meaning I failed trying to yank 412 pounds off the deck instead of 405, a small consolation.